Your yard is your playground. Enjoy it any time, day or night. We know lawn irrigation and outdoor lighting. Your home is your sanctuary, and your yard is your playground. Your home is your sanctuary, and your yard is your playground. Coming home to a healthy, well-lit, and beautiful yard everyday doesn’t have to be a far-fetched fantasy when you work with Aqua-Bright. We can help illuminate and improve your lawn, gardens, and outdoor entertainment area, to ensure that your home is a space of relaxation, where you won’t have to deal with the stress of your daily life. Whether you are looking to have an automatic sprinkler system installed, or you want us to hang your lighted holiday wreaths, we will show up on time and get the job done right without fail. Aqua-Bright is ready and eager to solve any of your and lighting problems, and we have the training to make it happen. When night falls on your stunning yard, it can be tough to maintain the magic. That can change when you add a little luster. Outdoor lighting can give your space an exciting make over and create the perfect atmosphere to entertain you or an entire party. Not only can these lights be beautiful, but they add an important element of safety to your home. A well illuminated home is not a good target for burglary. We can also help you brighten your home up for the holidays or other special occasions. At Aqua-Bright, our number one goal is to make sure that every customer is more than happy with our work. We want to build a relationship with your family so that you always know you can call us for your lighting and irrigation projects. It is not enough to simply satisfy the customer. 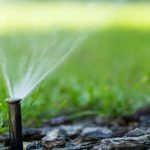 Irrigation, landscape lighting, drainage and basement waterproofing – if you want these services done right call Aqua-Bright today at 410-489-9009 or email us.